Corn oil will not only enrich the taste of sauces and salads, but will also improve the condition of the skin, hair, and nails. What properties and cosmetic use does corn oil have? What is its composition? Corn oil is one of the best vegetable oils used in care. Its composition determines it because corn oil contains a total of 85% unsaturated fatty acids, namely linoleic (omega-6) and oleic (omega-9). In addition, it is a wealth of vitamins A, C, E and group B.
Unrefined and cold-pressed is the healthiest corn oil you can get. The natural product is orange or red, and after purification processes, it takes on a yellow color. Corn oil belongs to drying oils, i.e. those that oxidize in contact with light or moisture. So in order to keep its properties for as long as possible, store it according to specific recommendations, that is, in a dry and shaded place. Corn oil is available in organic food stores, on the Internet, whilst the oil intended for cooking purposes is available in supermarkets. Corn oil provides antioxidant properties and also effectively nourishes, moisturizes and strengthens. In addition, it regenerates damaged cell membranes and inhibits the aging of cells. Thanks to the fact that corn oil abounds in vitamins, unsaturated fatty acids, phytosterols and many other nutrients, it will work in the care of all skin types. Its properties will be appreciated by women who have dry, oily, combination, mature and atopic skin. Corn oil will help the treatment of psoriasis thanks to the balance of omega-3 and omega-6 fatty acids, which alleviate skin inflammation and solve the problem of dehydrated and flaking off epidermis. 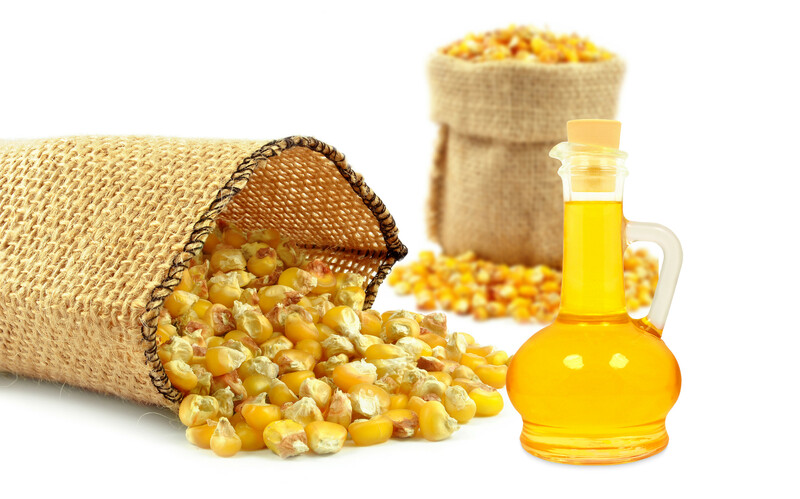 Corn oil can be used in hair oil treatment. Moisturized hair and strengthened bulbs are the beneficial effects of regular use of corn oil. In addition, corn oil combats the problem of excessive hair loss. The oil owes this feature to the content of vitamin K, which allows proper absorption of calcium. Corn oil can be used on both dry and moist skin, depending on our needs; nevertheless, it will provide thorough moisturizing. For this purpose, it is enough to massage a few drops of oil into the skin of selected areas. Corn oil can be also applied to the face – just in a small amount so that it can be easily absorbed. Nothing prevents you from enriching a cream or a body balm with a few drops of oil to intensify their effects. With the help of corn oil, you can also perform oil hair treatment. For many women, hair care is an unpleasant and expensive task: it requires not only choosing the right cosmetics (which cost a lot), but also skillful and systematic use. Imagine that you can look after your hair differently than just wash it with shampoo and apply a conditioner. For this purpose, apply oil to the hair. Corn oil will be a good choice. The amount of oil depends on the length and thickness of your hair, the degree of dehydration and the extent of skin irritation. After an hour, it is advisable to wash your hair with a shampoo without irritating ingredients, such as SLS and SLES. And that would be enough. General improvement of hair condition. Corn oil improves blood circulation and supports the fight against dandruff. Nails should be nourished with corn oil the same way as skin and hair. For this purpose, spread a few drops of oil all over the nail plate and the surrounding cuticles. You can wait until it is absorbed, or wash it after a few or several dozen minutes.